Zarolia Barristers believes in fighting for justice. We do not classify cases as big or small. Every client is equally important to us. Our experience and expertise in the field of personal injury has helped us to negotiate, mediate, arbitrate and litigate injury claims and accident benefits. We pride ourselves on representing victims, not insurance companies. We are confident that we will continue to provide victims of accidents with justice. We cannot make you well again. What we can do is ensure that you are compensated justly in the only way that is available to us - financially. Our lawyers will do whatever it takes to achieve the best results for our clients. We have an excellent team of experienced lawyers, support staff, and law clerks who work together to ensure that the victim receives justice and adequate compensation. If you feel financially crippled after an accident or need someone to stand up against an organization or employer, we are the advocates for you. We are committed to providing you with thorough research into the details of your case and we will produce results. If you or someone you love has been involved in an accident, don’t hesitate to call Zarolia Barristers. FREE CONSULTATION: We will make ourselves available to meet with you for free in order to discuss your case before retaining our firm. ETHNIC DIVERSITY: At Zarolia Barristers, our staff speaks a variety of languages including English, Punjabi, Portuguese, Italian, Croatian, Bosnian, Russian, Serbian, Hindi, Urdu, Cantonese, Mandarin and Spanish. HIGHLY MOTIVATED: As personal injury experts with years of experience in dealing with insurance companies, we anticipate and address the issues in your personal injury case so your claim is expeditious and handled correctly. EXPERIENCE AND EXPERTISE: Our lawyers and support staff at Zarolia Barristers have extensive knowledge and expertise in carrying personal injury claims. Our staff is well-versed in the constantly changing Rules of Civil Procedure, the Insurance Act and the Statutory Accident Benefits Schedule. As personal injury law is the only type of law we practice, you can be assured that you are in the right hands. DEDICATION AND COMMITMENT: At Zarolia Barristers, we care! Our staff is dedicated to each and every client. Throughout each stage of your claim, we provide you with updates and are always available to answer any questions that you may have. We are committed to assisting you in resolving your personal injury claim in an expeditious manner. At Zarolia Barristers we focus on personal injury law. Our team of educated and passionate lawyers handles motor vehicle accidents, slip and fall accidents as well as short or long term disability claims. A serious car accident can be a very traumatic and difficult experience. Whether you are involved in a small fender bender or your motor vehicle is a total write off, you need to know your rights. The main thing clients have to keep in mind is that Ontario is a “no fault” jurisdiction. 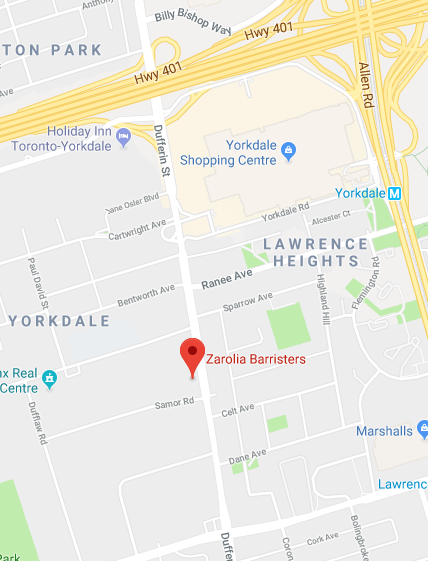 Our office is located 3200 Dufferin Street near Yorkdale mall.